Sublette County BOCES held four Aerospace Adventure Day Camps for children in kindergarten through eighth grade last week. BOCES and Sublette County 4-H came together to teach the class. The students assembled two different kinds of rockets, then fired them high in the sky. 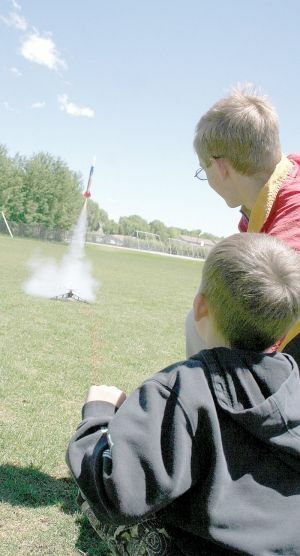 DJ Tabler (left) fires off his rocket with the help of instructor Matthew Shafer. Photo by Pam McCulloch.